We are happy to provide events that are open to the public and will work closely with you to provide a murder mystery event that will delight and stimulate your guests' little grey cells. Most of our stories are designed to be humourous as well as intriguing, with plenty of daft characters, red herrings and plot twists. We can provide plots and performers to suit any venue, from castles and hotels to restaurants and village halls and adapt the story to suit both guests and venue. We usually suggest that public events should host between 30 and 120 guests, but we can work with fewer or more than this in most cases. We run public events throughout the UK, but are based in Somerset in the south west of England. 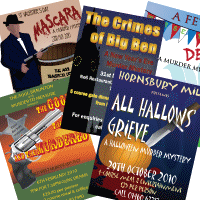 A list of forthcoming public events is shown to the right, or you can visit the full list of public murder mystery dinners. We appreciate that you cannot always predict from the outset how many guests you will attract, so remain flexible in the number of suspects that we provide. We usually suggest a ratio of 1 suspect per 15-20 guests, with a minimum of 3 performers. Plots can be provided off-the-shelf or we can adapt or write something specifically for you. We will help you promote your murder mystery via our website and mailing list and are happy to advise on all aspects of the event to ensure that your night goes with a bang. A scenario typically lasting 3 hours, usually over a meal. Clue sheets and writing materials for all guests. All props (clues, documents, weapons etc) directly associated with the story. Certificates and prizes as appropriate to the scenario. Costumed performers act in the scenario as required.